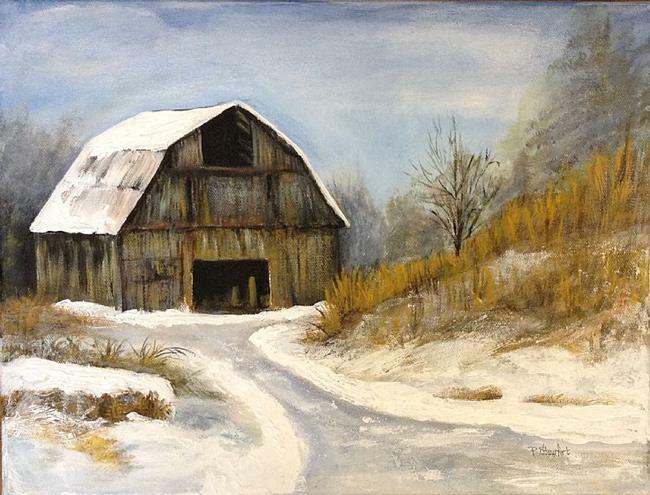 Winter Snow Scene, Old barn in the country, with bare trees and brown grasses. It is painted on the sides 3/4 inch deep stretched canvas. You could hang it without a frame. Painted from a photo by Bronna Wilson on Paintmyphoto.ning.com. Acrylic on stretched canvas, 12 x 16. Texture with heavy paint and palette knife. For Sale on Daily Paint Works at my Gallery.